Click on the photo to check out an interview with the ladies behind some of DC’s favorite places for cupcakes, from NBC4. Washingtonian magazine taste-tested them and here’s their top 4, from the May issue. 1. Adour, $22/dozen, 202-509-8000. At nearly $2/each, isn’t it weird that boutique cupcakes look like a deal in comparison? 2. Michel Patisserie, available at ACKC, 202-387-2626. Washingtonian recommends the chocolate and raspberry flavors. Pie V. Cake recommends the passionfruit (review here: http://bit.ly/bdKK86). $2 each. 3. Fancy Cakes by Leslie, 301-652-9390. These are $1.85 each and larger than your average quarter-sized macaroon. 4. Restaurant Eve, 703-706-0450. $8 for 6. They do a Guiness macaroon that’s actually supposed to be good. Call in advance to order these babies from Adour. Goodies from Nando’s Peri-Peri. Or, how I risked diabetes for this review. Nando’s confuses me because the first time I went there, I thought it was Portuguese (their egg custard natas tipped me off). Then Pie told me it was a South African chain. Today, I learned on Wikipedia that it’s a South African brand with a Portuguese/Mozambiquan theme. WT? Supposedly they’re one of South Africa’s biggest exports and their first U.S. store is the Gallery Place location. (That’s right, NYC, we got ’em first.) They also have a Dupont location, and word is they’re opening one in Silver Spring. We know they make good chicken and sandwiches (Pie, the vegetarian, likes the portobello-Halloumi sandwich), but how are the desserts? Let’s review. Nata: You can find natas in part of Asia like Hong Kong and Macau, since the latter was a Portguese colony. As a kid, I was addicted to those Chinese egg tarts you get from Chinatown bakeries (not that there are any left in DC, *sound of teeth gnashing*) and the dim sum cart. So imagine how psyched I was to find a caramelized version. This would probably be even better with a piece of bacon on top, a la my friend Jyl. Raspberry brulee cheesecake: I take issue with the description on the menu (“Hand-fired for a satisfying crunch”), which made me think there would be a nice, crispy brulee top. As you can see from the pic, the reality is bleaker. I’m underwhelmed. Maybe the Portuguese/Mozambiquans should leave the cheesecake thing to us Yanks. 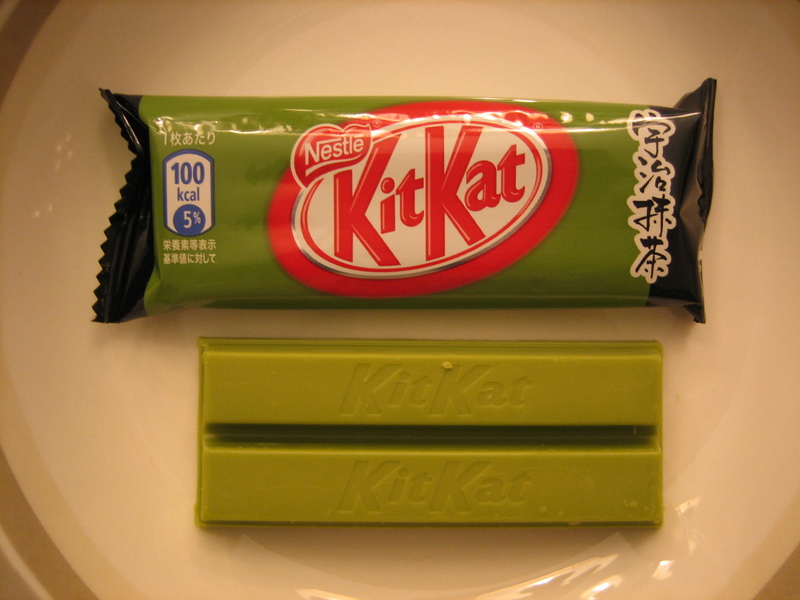 Given that we’ve already posted twice about Japanese Kit Kats, it was high time that we tried one. Mr. X-sXe’s coworker must have read our minds, because he brought this back from Japan. Inside are two individually wrapped Kit Kats. 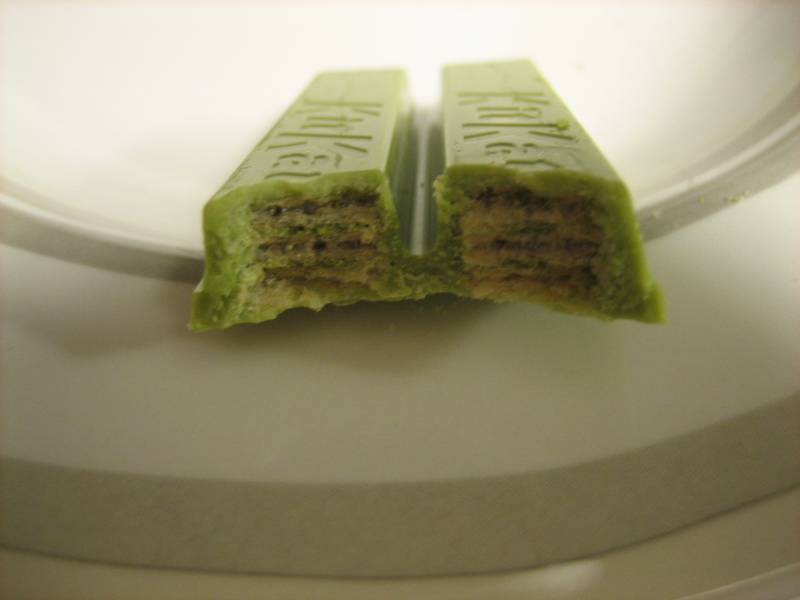 While we could see the green tea incorporated into the chocolate and wafers (see X-section photo), we both came to the same conclusion separately. It tasted overwhelmingly of white chocolate. 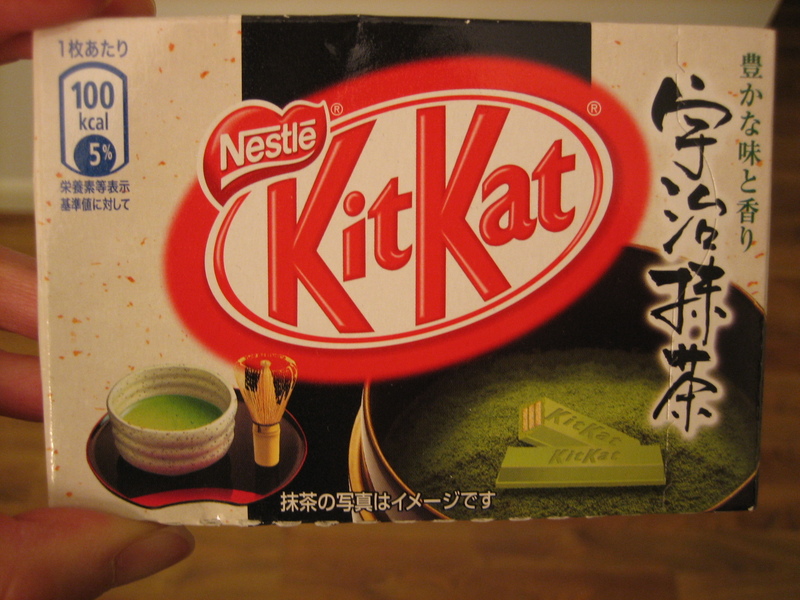 If you really want a Kit Kat that tastes like green tea, you’re gonna have to dip this in matcha powder. Oh well. We’ve been on a Cuisine Solutions kick lately, after learning that Citronelle’s Michel Richard gets his braised shortribs from this company (isn’t that cheating?). For their meats, they use a special sous vide cooking process, where food is cooked at a low temperature for a long time to preserve its texture, flavor, etc. These souffles cook in the oven in about 15 minutes. I enjoyed the marshmallowy texture, complemented by a sugar-cookie base. But the orange coulis. What a letdown. It reminded me of the canisters of frozen Minute Maid concentrate that my mom bought when we were kids. Didn’t taste fresh–I probably could have done better by juicing and zesting some navel oranges, reducing the liquid over the stove with a bit of sugar. We had a hankering for pho yesterday, and there’s nothing better with a hot, steaming bowl of pho than a Vietnamese drink like this one. Although it looks like some kind of science experiment, don’t be afraid. That’s just a salted dried plum plunked into a sweet/sour/salty drink. Not salty enough to be off-putting, but just salty enough to bring out the sweetness. As long as you’re not averse to sipping up floaty bits in your drink, you’ll probably dig it. Tiny chocolate burgers. Thank you, Japan. A coworker brought these back from San Francisco’s Japantown. 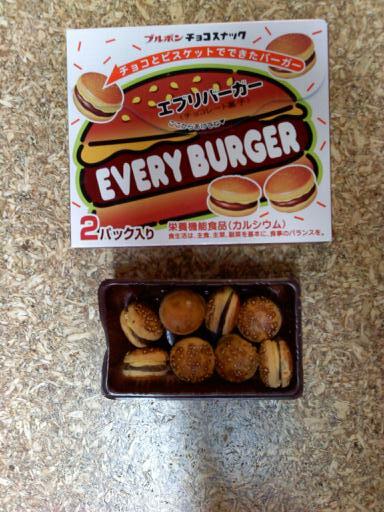 Every Burger candies are cracker “buns” sandwiching a chocolate filling. The level of detail here is something to marvel at, down to the layer of cheese (or mustard, depending how you look at it) and sesame seed-dotted bun. The first thing I thought when I tasted this was that it reminded me of inside-out Pocky, which is a cracker stick coated in chocolate, and yes, it’s also Japanese. In fact, there’s even a men’s version with dark chocolate. 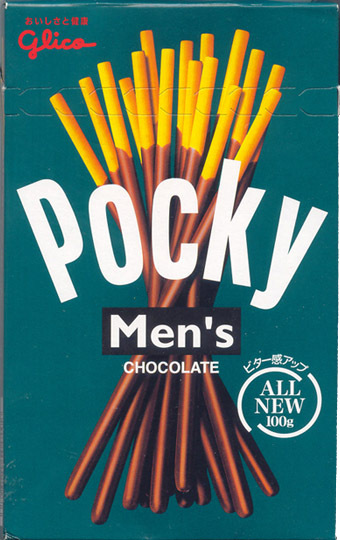 Either Japanese men like their chocolate dark, or Pocky was trying to make it socially acceptable for them to munch on delicately thin crackers. 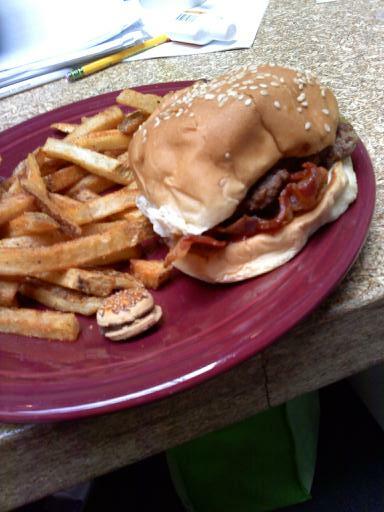 Subconsciously or not, I grabbed Five Guys for lunch today. Here’s how Every Burger sizes up next to a real burger. Just in case you were wondering.